Visit European Christmas Markets on a P&O Ferries mini cruise from Hull, from £40 per person. Get a dose of festive cheer by visiting Christmas Markets in Europe on a P&O Ferries mini cruise. Visit the wonderful Belgium market in Bruges or check out the markets in Amsterdam. 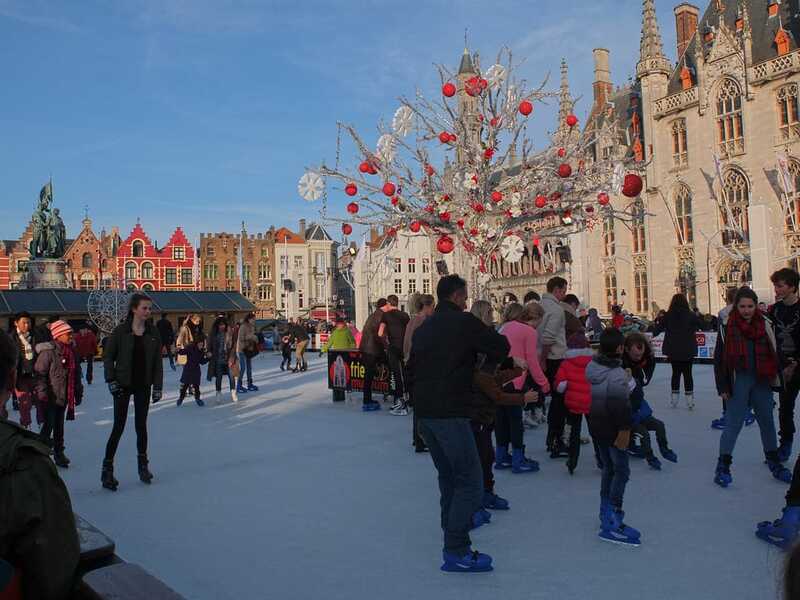 Running every day between 23rd November 2018 and 1st January 2019 are the Christmas Markets in Bruges' Grote Markt. It is open daily from around 11am to between 8pm (or 10 pm on Friday, Saturday, and Sunday). Book a two day mini cruise ° from Hull to Zeebrugge (Bruges) and enjoy two nights' accommodation onboard a comfortable ferry. Sail overnight while you sleep and arrive in Belgium the next morning. Take the coach transfer to Bruges and it will drop you off near the train station. Head over to Grote Markt to experience these wonderful Christmas Markets. TRIED AND TESTED! I sailed to Zeebrugge with P&O Ferries. You can read my Bruges mini cruise review here. You'll have the day to experience the markets before you'll need to catch the bus transfer back to the ship. Don't book this one though. Instead, book the 3-night cruise-and-stay option. You'll have two days and one night in Bruges, so you can experience the Christmas Markets as they are meant to be seen - in the cold dark night with the festive lights twinkling away. There's a small surcharge on the ferry tickets compared to a standard mini cruise (from £10 per person). You'll also need to book your one-night hotel stay separately, although this means you can book a hotel that suits your style. To book, choose the "3 night" option when you get a quote. Winter Village at Winkelcentrum Stadshart, Amstelveen between 29th November 2018 and 6th January 2019. Funky Xmas Market at Westergasfabriek on 2nd December 2018. Ice Village Amsterdam at Museumplein between 14th and 26th December 2018. Amsterdam Winter Paradise at RAI Amsterdam, Europaplein, between 21st and 30th December 2018. As with the sailings to Bruges, the majority of the sea voyage happens overnight as you sleep. Book a two day mini cruise ° from Hull to Amsterdam (via Rotterdam) and enjoy two nights' accommodation onboard a comfortable ferry. Sail overnight while you sleep and arrive in The Netherlands the next morning. Take the coach transfer to Amsterdam and it will drop you off near to Amsterdam Centraal Train Station. From here it is easy to visit the festive attractions using public transport. TRIED AND TESTED! I sailed to The Netherlands with P&O Ferries. You can read my Amsterdam mini cruise review here. You'll have the day to experience the festive attractions (and to cram in some last minute Christmas shopping) before you'll need to catch the bus transfer back to the ship. To experience Amsterdam's nightlife in winter, book a three-night mini cruise from Hull to Rotterdam (via Amsterdam) instead. You will need to book a one-night hotel stay in the city separately, but this gives you the flexibility to stay wherever you choose. To book, choose the "3 night" option when you get a quote. Rotterdam doesn't really do Christmas Markets. There's a few events here and there but nothing as jolly as Amsterdam's Winter Village or Ice Village, or as joyous as Bruges Christmas Market in Grote Markt. But head down the road to Dordrecht for the largest Christmas Market in The Netherlands. The catch? You'll need to visit between 14th and 16th December 2018. Dordrecht train station is a 15-minute train ride from Rotterdam's Central Station, so it's feasible to cram this into a 2-night mini cruise to Rotterdam °. Better still, book the three-night mini cruise from Hull to Rotterdam. You'll need to book a hotel stay separately but this means you could book a night in Dordrecht. So you arrive in Rotterdam port, catch the transfer bus to the train station, and then hop on a train to Dordrecht to spend the afternoon and night there. In the morning, you could catch the train back to Rotterdam and have a day exploring the city before catching the transfer bus back to the port for your return sailing. The best of both worlds, don't you think? The sailings above are based on P&O Ferries' 'Mini Cruises Mini Prices' promotion, where two-night mini cruise fares start from just £40 per person, based on two sharing an inside cabin. Daily sailings are available, meaning you can choose the dates best suited to you. Certain days incur a surcharge, and all dates are subject to availability. The dates and times of festive attractions are subject to change. Transport, and entrance fees where applicable, to the festive attractions, are not included in the mini cruise fare. If you book a mini cruise offer, your return transport from the port to the city centre is included in the price.